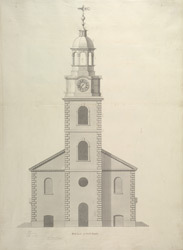 Architectural drawing showing the elevation of the west end and tower of Christ Church in Great Surrey Street (later known as Blackfriars Road) in Southwark. This church was established in 1671 on part of the Paris Garden Manor. However it was rebuilt in 1738-41, probably by James Horne. The materials used were brick, with stone quoins (dressed stones at the corners of buildings). It has a square west tower and the drawing shows measurements of the spire.